Hi foodies...Welcome to AYESHA'S KITCHEN. Today am going to share a very easy , chewy and fabulous marbled brownie recipe. 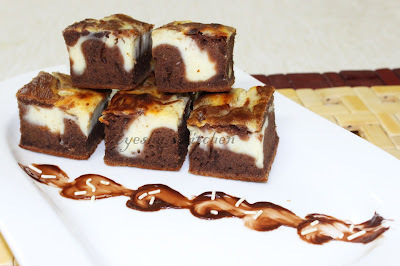 Can also be called as cheese cake brownies as i used cream cheese as one layer. The marbling is done by swirling in the cream cheese mixture and flour mixture. 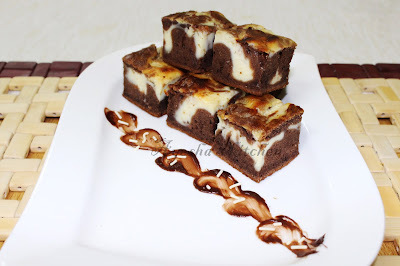 Here is the recipe of both impressive and extra delicious marbled brownies. Grease the baking tray and line it with parchment paper. Now start by preparing cream cheese mixture. Whisk the cream cheese until smooth. Then add sugar, orange zest, orange juice. Whisk well. Then add egg, incorporate well and set aside. Now prepare brownie batter. In a bowl mix together flour, baking powder, cocoa powder and salt. Melt the chocolate and butter by double boiling method. Stir occasionally until smooth and remove from heat. Add sugar, whisk well. Add eggs one at a time and whisk well. Now add vanilla essence and then slowly incorporate the flour mixture until well combined. Do not add whole flour at a time. Now pour the batter evenly into the pan and reserve some batter for making swirls. Spread the cream cheese mixture over the batter slowly. Top it with some few spoons of chocolate batter and with a knife create swirls. Bake for 20 - 25 minutes at 180 degree C until set. Let it cool completely and refrigerate for few hours or overnight.